What settings or changes do I need to set up in Firefox 3 for EPS to work? If I go to Tools, Options, Advanced, Configure how Firefox connects to the internet......then what? Where can I find detailed answers? Re: What settings do you need for Firefox? I have followed the instructions for the Firefox 3 add-on and I can confirm it IS installed and Enabled. However, when I select a working proxy IP and connect to it via EPS, then return to my browser...nothing is different. It still says "Direct Connection" in the bottom right corner. Also, when I visit the "What is my IP" link, it shows my provate IP address and not the proxy I am supposedly connected to. All in all, I would say that this is not interacting with Firefox at all! 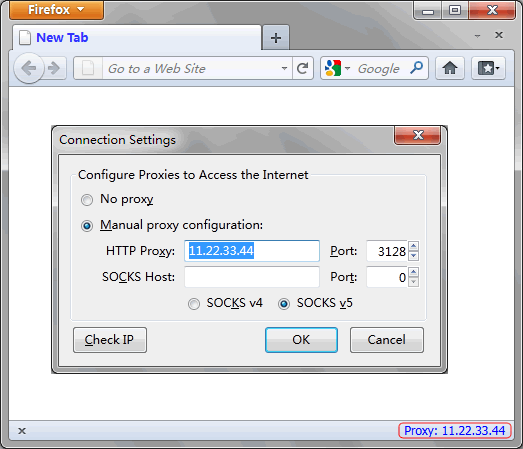 I have checked the setting in Firefox in Tools > Options > Advanced > Network > Settings and it is has "No proxy" selected. Do I need to change this manually? I got the impression that the Add-on was supposed to make all the necessary changes automatically. At the moment the only way I can use this program is to check whether the IP is valid then manually configure Firefox to use that Proxy manually...it's not very use friendly. Surely there must be another way? Maybe there are some problem in the communication between Firefox and EPS. Please close your Firefox and start it again. Of course there is a bug, I have been struggling with this problem for months. We cannot switch off Firefox every time I need to switch to a Proxy. can anybody help or fix the problem. Just installed Elite proxy switcher. whenever I change my IP to a proxy, i simply can't browse again i.e my system does not see the internet again! what i'm i missin? or is it my internet service provider that's blocking me each time i change my Ip (can they do that?) or i'm i missing some setting. You can manually set the proxy setting to "Direct Connection" to disable using the proxy.